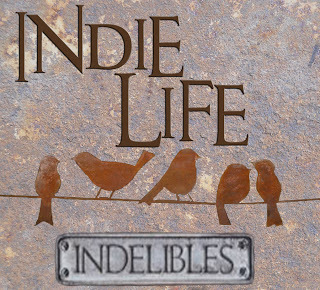 Welcome to my Indie Life post for April. This is a monthly feature posted on the second Wednesday of the month and hosted by the Indelibles. The aim is to promote, encourage, and support indie authors. The downside was the rail system decided to throw a rather large spanner at me, and the trip that should have taken an hour actually took an hour and a half. The trip home was worse, taking two hours and three trains. Anyway, I got to have an early lunch with fellow Sydney-sider and Indie author, Dionne Lister. Dionne has self-published two fantasy novels and a book of short stories and I was really excited about my opportunity to chew her ear off about so many things. We talked, we laughed, we exchanged books, and I had a fantastic time. So much so I didn't want to go home. There were so many other things we could have talked about, and so many questions I wish I'd asked her. Until I met with Dionne, I've felt somewhat alone in the Indie publishing world. Don't get me wrong, I've had a tremendous amount of support, and I've made many friends since I decided to embark on this journey, but most of them are overseas, particularly in the States. When the chance came to actually sit down and talk to someone who is doing what I'm doing, jumping over the same hurdles as me, and experiencing the same roller coaster ride that is being an Indie author, I took it. The train ride may have been hell, but it was so worth it. Plus I had time to read. Right now the one thing I love about being an Indie is the support and enthusiasm of the people I've met so far. Thank you, Dionne, for making me feel like I'm not alone, and that I can achieve anything! That was a great lunch! I love meeting authors in person and we could have kept talking all day I think lol. Can't wait to do it again :).